tombola, Britain’s biggest bingo site decided to find out what Brits are most afraid of. 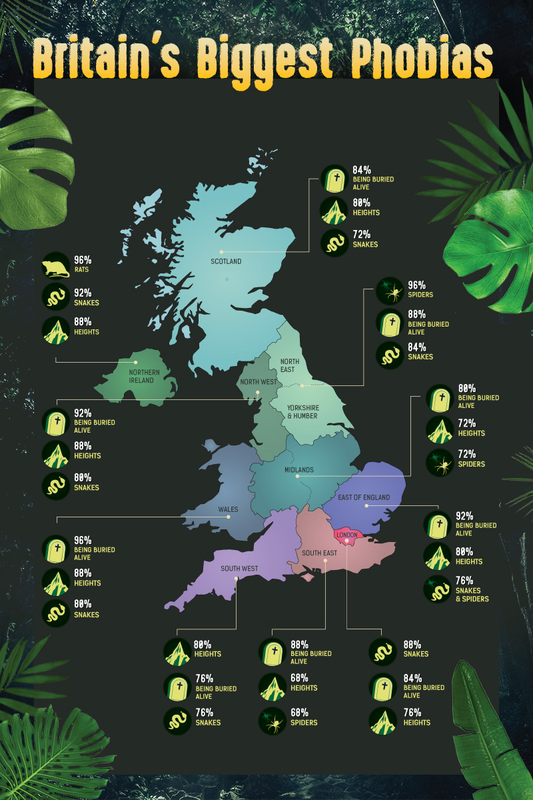 We conducted a survey across the British public to investigate what’s keeping them terrified. 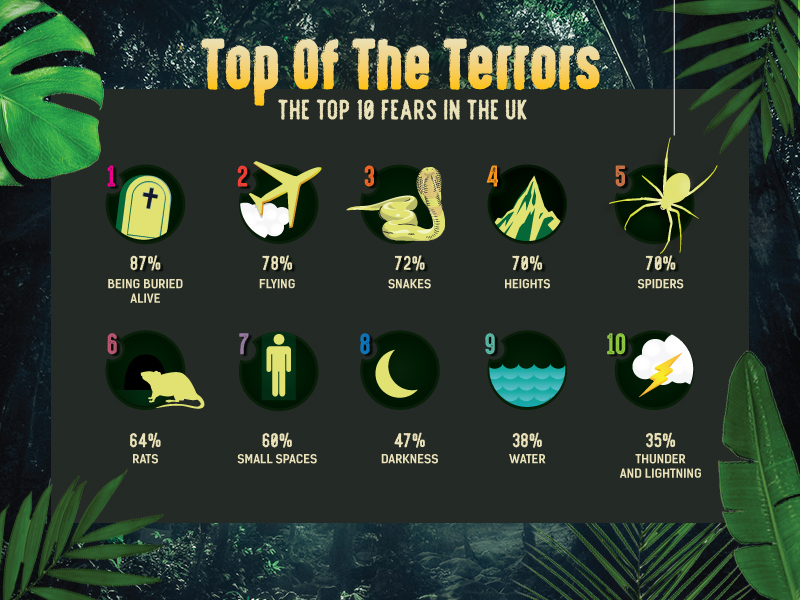 It turns out that 86% of Brits have a fear or phobia of some kind, and the thing that’s scaring us the most? Being buried alive. With a shocking 74% of Brits ranging from “slightly afraid” to “terrified”, being buried alive tops our terror list. When looking at regions in the UK, many of us are most afraid of being buried alive, but there are some differences. In London for example, the top fear is snakes, while in Northern Ireland it’s rats. Sally Baker, a senior therapist from workingonthebody.com in London says, “It’s not surprising that the top fear is the primal fear of being buried alive (87%), or "Taphophobia" to give it its official name. It’s also not surprising that it is closely aligned with a phobia of small or enclosed spaces (60%). This is a learned and ancient fear with references found as far back as Roman times when convulsions, seizures or fevers could cause people to experience a comatose or near-dead state. It is feasible that with only the most rudimentary medical understanding that misdiagnoses were made and that premature burial, or worse did take place. 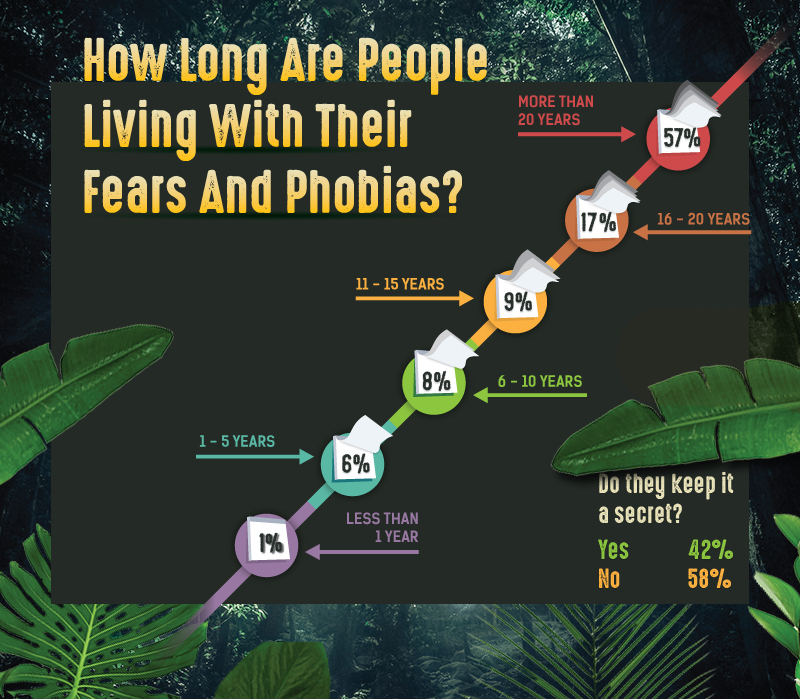 Whether a fear is hardwired or learned, there are many ways to overcome it and so it’s perhaps a sad discovery that over half of Brits have suffered with some type of fear or phobia for more than 20 years. Even more disturbing is that similar numbers keep their fears a secret. Fears and phobias are quite a normal response by the brain to anything it might find threatening. Yet the brain can sometimes overreact, causing the fear to be disproportionate to the actual threat. 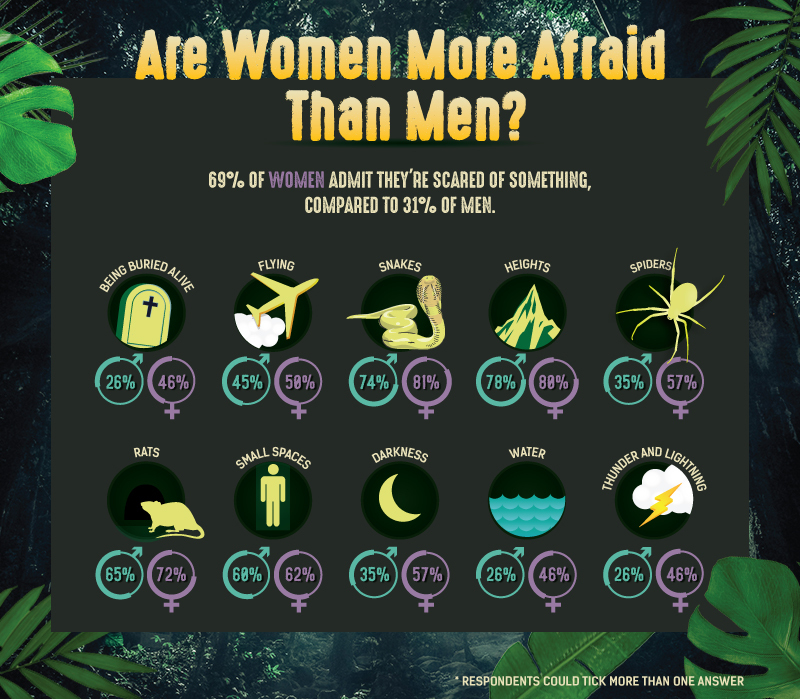 Despite it being a very human response, almost half of the people we surveyed said that they kept their fear or phobia a secret from most people. Interestingly however, it’s the xennial generation that seems most secretive. Those aged between 25 – 44 accounted for more than half of those choosing to keep their fear hidden. Those younger or older are more open with their friends and family. Those under 18 or over 65 showed the least secrecy at 1 and 2% respectively. Nabeel Khalid, a digital marketer from London has a fear or grasshoppers he calls “irrational”. He says, “I have had to divulge this fear to my partner who does emasculate me about it and that is why I keep it hidden as much as possible”. When asked if he had tried any treatment to help overcome the fear, such as cognitive behavioural therapy or hypnosis, he was hesitant. “I haven’t yet used anything of the sort. Not sure if I’d use hypnosis even to help me quit smoking – maybe I have trust issues” he muses. Ultimately however, he doesn’t think that the phobia affects his life enough to try something that he calls “drastic”. The results of the survey showed that xennials are the most fearful. 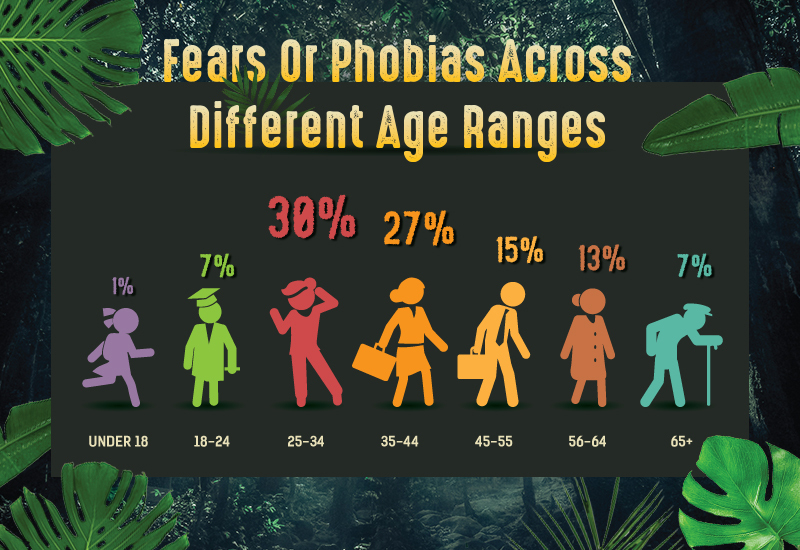 Those aged between 25 and 44 made up more than half of those who reported having some kind of fear or phobia. The least scared were those under 18, which suggests that most of our fears are learned behaviours. The good news about that, is that anything we can learn, can be unlearnt too. If you suffer from a phobia, it might be helpful to know a few things about what’s happening to your body, so that you don’t panic even more. Harley Street Hypnotherapist, Adam Cox gave us his advice on how to combat your fears and phobias. 1. Educate yourself – Many fears come from ignorance, the more you understand your fear the easier it is to defeat it. 2. Develop a curiosity or fascination – It’s possible to find something interesting or fascinating in any area. Once you find something intriguing it changes your associations with the trigger of your fear. A fear of snakes can be helped by finding out that the gender of snakes can be determined by the temperature of the eggs for example. 3. Use your imagination – It’s possible to perceive your fear in different ways by changing the size, shape, colour etc of the images you make in your mind. There are a wide number of techniques that can reduce the fear simply by how you think of the stimulus. 4. See a phobia specialist or hypnotherapist – There are experts that can help you cure a phobia in a single session or single workshop. 5. Do the thing you fear - When I was scared of heights I booked a sky dive. When I was scared of public speaking I took up stand-up comedy. To quote Ralph Waldo Emerson – “if you do the thing you fear the death of fear is certain”. Our brains are so complicated that fears can be literally anything. If you’re thinking you’re alone, you are most definitely not. Some of the other phobias that came up in our survey were cotton wool, clowns, choking, needles, beans, ventriloquists’ dummies, ladybirds and big noses. If you’re looking to tackle your fears in the craziest way possible, take a look at our article on Best Places To Face Your Fears. To find out more information on counselling for fears and phobias, check out the Counselling Directory.